SEATTLE, Aug. 25 /PRNewswire-FirstCall/ -- Boeing (NYSE: BA) today delivered a 777-300ER (Extended Range) to KLM Royal Dutch Airlines. 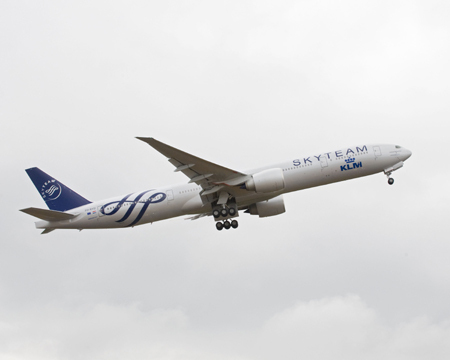 The airplane has been painted in a special SkyTeam livery in celebration of the alliance's 10th anniversary. Today's delivery marks the start of an in-service evaluation using chrome-free decorative paint and primer. As part of Boeing's lifecycle approach to reducing environmental impact and in response to KLM's and other customer's requests, Boeing has introduced a chrome-free primer and chrome-free exterior decorative paint to this airplane. In addition to simplified health and safety monitoring requirements, a chrome-free primer reduces the environmental impact of the paint and stripping process. Removing chrome from the paint and primer eliminates the need for special handling of paint waste and clean-up and designated offsite disposal areas. Boeing will apply the non-chrome paint and primer on up to 14 airplanes across Boeing models for in-service evaluation with the intention of making it a standard option in the future.